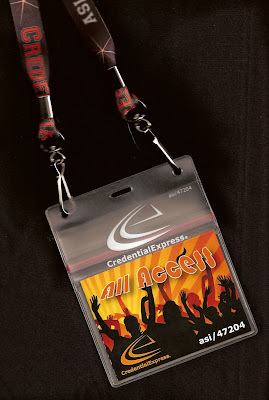 A simple way to make event credentials more secure is to combine the badge, badge holder, and lanyard as an integrated unit in which all three components must be presented together be considered a valid credential. This is functional, secure, and cost effective. And it looks hot! PS: Our team of experts are happy to discuss security features and related costs if you require additonal security elements for your event credentials. Dye-Sub Lanyards at Screen-Printed Prices! 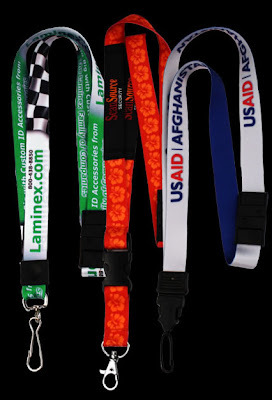 Promotional Products Distributors can take advantage of special pricing on CredentialExpress Dye Sublimated lanyards. Save up to 50% in some cases. Hey, even Bob gets asked for a photo ID every now and again. Looks like some of the kids need to dig a little deeper into the D section of their iTunes libraries. Read the AP story here. Police: "...what are you doing here?" Thankfully everyone was apparently cooperative and the whole thing ended up a nonevent. Can you feel the love? We can. Mr Dylan will no doubt get a song or two out of it. For the rest of us less socially-recognizeable citizens, keep on carrying that ID. It helps the good guys do their jobs more easily. 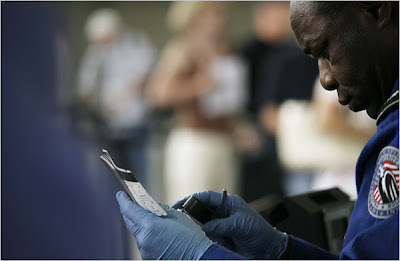 In the first phase, which was instituted earlier this year, the security agency asked airlines to begin collecting passenger names as they appear exactly, letter for letter, on government-issued IDs like passports and driver’s licenses. The second phase, effective Aug. 15, requests airlines to ask passengers for their gender and date of birth. We say: Most of the time my airline ticket says "KARLA ZIEGLER" instead of "KARL A ZIEGLER". I tend to wonder if this inspection is actually effective and if we can come up with a better, less painful way to do the whole screening process while increasing security.